The exquisitely handcrafted Barrel-Botanica picnic basket was designed with elegance and romance in mind. The Barrel-Botanica is a barrel-shaped, two-lid willow basket with deluxe service for two that features durable PE (polyethylene) lining in Botanica Leaves design and Sage. 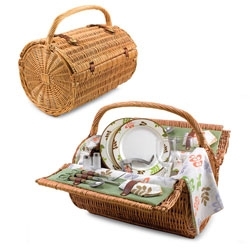 Experience the finer moments in life with the Barrel-Botanica picnic basket.